Anyone who complains about having too much on his or her plate should take a peek at Vendela Vida's. Between writing novels, co-editing The Believer magazine - a monthly buffet of off-beat book reviews, essays and interviews - teaching at a nonprofit tutoring center and raising a young daughter, it's a wonder she finds time to order take-out, let alone fly across the country for a cameo at her alma mater. 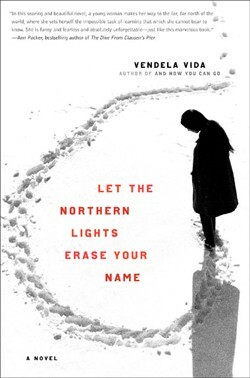 But this Monday, April 9 - 14 years after graduating from Middlebury - 35-year-old Vida will return to the college's Mead Chapel to read from her new novel, Let the Northern Lights Erase Your Name, alongside her writer-hubby Dave Eggers. Vida's novel tells the story of a 28-year-old woman who travels to the Arctic in an attempt to uncover a family mystery. Eggers is no literary slouch himself, of course: His first novel, A Heartbreaking Work of Staggering Genius, was a Pulitzer finalist, and his literary journal McSweeney's Quarterly Concern culls kooky, irreverent fiction from some of the best writers in the country. Also on Monday, he'll read from his latest work, What Is the What: The Autobiography of Valentino Achak Deng. The novel is based on the harrowing journey of one of the "Lost Boys of Sudan" from Africa to Atlanta. Seven Days caught Vida on the phone at The Believer magazine headquarters in San Francisco to discuss literary life, narrativity and the mysteries of her kitchen cabinets. SEVEN DAYS: You are co-editor of The Believer magazine. In this month's issue, a writer is paraphrased as saying, "Literature should inhabit books, not bars." Is The Believer subverting that idea by taking literature out of books and into culture? Are you guys trying to make literature less stuffy? VENDELA VIDA: I don't know if we're trying to make it less stuffy . . . In literary circles, there can be a lot of talk about the stuff that's extraneous to books - how much money someone was paid, or if a film was being made out of a book, or who this person slept with . . . There's an old saying in New York that people actually talk more about reviews of books than the books themselves. In many ways, we're trying to put the books into the readers' hands and [take them] out of the bars. But we're also trying to give people access to books that otherwise wouldn't get a lot of attention. For example, books published by small presses, or by authors you haven't heard of, or by foreign writers. It's kind of both, in a way. Maybe we're just putting the discussion into friendly terms? SD: Maybe it's a bar with a casual ambience, rather than a frat bar? VV: [Laughs] That's good . . .
SD: What was that about? VV: I don't even know why I was there. I've made some forays into screenwriting and stuff like that. Maybe that's what it was about? SD: You seem to have a strong appreciation for visual art. The American Society of Magazine Editors just nominated The Believer for a design award; the protagonist of your first novel is an art history student. But is the relationship between literary and visual art these days a healthy one? Is there anything in particular you're doing to bridge those worlds? VV: It is [a healthy one]. In our art issue, we featured great literary writing about art. It'd be great if there were more art about literature - I don't know how that would happen. But we try to incorporate the two. [As a writer], when you're trying to pick a profession for your characters, you don't want to make them grad students in English literature. It always cracks me up to see how many New Yorker stories feature people making pottery. I think it's shorthand for writers to talk about art without exposing themselves. SD: So it's a way for writers to explain what they're feeling, but indirectly? VV: Right. In Let the Northern Lights Erase Your Name, I gave Clarissa the profession of film subtitler. That choice fit pretty well into the themes of the book. She's not translating; she's just kind of fixing up other people's quotes to make them more accessible and less archaic. It was a deliberate choice, because the whole book was about communication and non-communication. Clarissa's whole job is to decipher and clarify language for people - and yet, she can't even decipher or clarify her own emotions or what's going on around her. SD: When I read your fiction, I think of that popular twentysomething phrase, "That's so random!" VV: [Laughs] That's so Middlebury. SD: Yeah, but you obviously have a knack for distilling the randomness of our lives into psychological order. Do you see yourself as a connoisseur of the random? VV: What I like to do . . . is take randomness and make narrative out of it. I'm a very narrative-oriented person, meaning I see stories all around me, and I try to make sense of things that happened in the past and how they relate to the future. Let the Northern Lights Erase Your Name was inspired by Galen Strawson's ideas on free will that he published in an essay called "Against Narrativity." It's about how about 95 percent of people consider themselves narrative-minded, as I do. But 5 percent of people are "episodics," in that they don't see their past as related to their current situation or their future. I was interested in writing a narrative-minded book about someone who considers her life in a non-narrative way. Clarissa is narrative-minded, and she's trying to make sense of her mother, who doesn't view her own life in the same way. SD: Do you feel a bond with those other 5 percent of people now? VV: [Laughs] No, I'm just completely intrigued by them. Sometimes I wish I could separate myself from stories, instead of trying to form narrative. SD: In Let the Northern Lights Erase Your Name, you write, "Travel is made for liars. Or liars are made by travel." But the protagonists of both your novels are such truth-seekers - not your average Lonely Planet wayfarers! VV: Both characters do "find themselves" in foreign countries - Ellis in the Philippines, Clarissa in Lapland. I believe travel affords both characters the opportunity to try on different masks - or lose them - which at first feels like a form of lying, but ultimately, I think, helps them figure out who they really are. Families and communities are wonderful things, don't get me wrong, but sometimes other people's perceptions of a person can keep that person in a holding pattern. In a way, both these women were lying to themselves - and being lied to by those around them - before making their journeys abroad. SD: You're obviously a fan of writerly conversation. You edit interviews at The Believer. You edited The Believer Book of Writers Talking to Writers. And you were founding board member of your husband Dave's tutoring center for young writers - 826 Valencia. Do you value the art of talking about writing at least as much as the craft itself? VV: To some extent, yes. The irony is that people think writers spend a lot of time talking about writing. My co-editor Heidi Julavits, [for instance], is also a novelist, and she's one of my closest friends. But the truth is, I don't know if we've ever talked about how we write, where we get our ideas from, or what styles we're trying to develop or explore. People don't talk about [writing] as much as you think. The interview's definitely an artificial environment - but sometimes it's the only way to get things out. SD: On that note, do you have any fond memories of seminar days at Middlebury? VV: I had a lot of good writing instructors [at Middlebury]. I also took some acting classes, and that was really helpful for writing. I think people underestimate the relationship between writing and acting: You can employ a lot of method-acting technique to writing. In my first novel, And Now You Can Go, my character was feeling so vulnerable that I had the idea she would crawl under the kitchen sink . . . I tried to do that in my own house, but our cabinet isn't big enough to crawl into. Too many pipes. So I went to a friend's house to go under her sink . . . And it helped a lot. I knew I had to do it to see what my character would notice while she was under there. When you start off writing a character, they take you in different directions than you'd ever anticipated - I'm not one of those writers that maps out what's going to happen in a book the minute I start. To me, that would be false. SD: By fitting your characters into cabinets, are you making a comment on the way we inhabit domestic space? VV: I think there's something about wanting the world around us to be smaller and more comforting. To get into smaller spaces and have less room around us . . . Freedom can be alienating, intimidating and ultimately frightening. SD: Does this have anything to do with our fossil-fuel complex? VV: [Laughs] I don't know. That's a good theory. SD: You read alongside former Vermont Poet Laureate Ellen Bryant Voigt at the Bread Loaf Writers' Conference in 2003. Did you feel that you were back on home turf? VV: It didn't really feel like home turf, no. I'd been to Bread Loaf when I was 20 or 21, when I was still in college, or just out of it. [In 2003], it felt more like I was remembering freshman orientation. SD: Have you spent much time in Vermont since graduating from Middlebury in 1993? VV: I haven't. But I'm really looking forward to going back there. SD: So are you Cali-to-the-core at this point? VV: Well, I grew up [in California]. Then I went to Middlebury for college. Then I went to Columbia and stayed in New York for my twenties, doing various magazine and editorial jobs, and writing my first book, [Girls on the Verge], which is nonfiction, before moving back to California about six years ago. But I have really fond memories of Vermont. SD: When you hear the word Vermont, what pops into your head? VV: I think about Middlebury on a pretty day: green grass. Then I picture it on a really cold day. [Laughs] It's funny, I have those images side by side. I don't picture my friends, or Middlebury [College]; I picture a lot of open space. SD: Your baby daughter is named October. Were you thinking Vermont foliage? Robert Frost's poem? VV: I've just always liked the month October. I'm sure it has all those connotations. But I also thought that, having grown up with my name, I wanted my daughter to have one that people could spell. SD: Do you and Dave have any plans for your Vermont visit? VV: We're going to see my old writing instructors at Middlebury - David Bain and Julia Alvarez. We'll also see my friend Sarah Stewart Taylor and her husband Matt Dunne, who ran for lieutenant governor. Sarah's a writer - but we don't have any plans to talk about writing. SD: Do you and Dave ever go on corny outdoorsy adventures? Do you have a canoe or something? VV: We don't have a canoe. We hiked Kilimanjaro a few years ago, for a cancer fundraiser. I don't know if that's corny or not. It's outdoorsy, though. I wish I had a canoe. It sounds really nice . . .